Chief minister Mamata Banerjee today iterated that she would keep coming up to the hills in what appears to be an obvious effort to challenge the hegemony of the Gorkha Janmukti Morcha, particularly given that municipality and panchayat elections are due. Speaking at the Himal-Terai-Dooars sports festival organised by the police administration at the play ground of Goethals Memorial School here, the chief minister said her visits to the hills were meant to encourage the people, particularly youths, to think big. "Why should you remain small, you become big... our government will render all possible help and continue helping, and I will keep coming (to the hills)," she said. Mamata said her government had been carrying out development activities in the hills even though her party was not in power at any level in the hills. "The municipalities are not in my hands. The GTA is not in my hands either. Had they been with me, I could have done little things that you all desire," she said, in an oblique criticism of the Morcha, which is in power at the GTA and all four hill municipalities - Darjeeling, Kalimpong, Kurseong and Mirik. The chief minister said she would be in the hills next month in connection with the formation of the Kalimpong district. "Kalimpong has become a district. Mirik has become a subdivision. 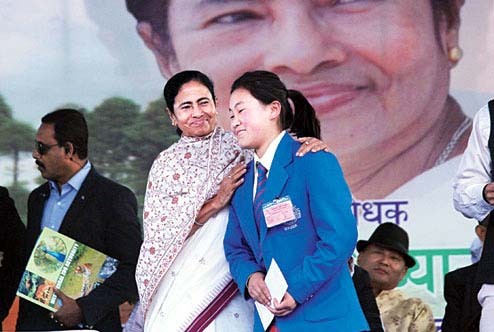 In this connection, I will be coming to Kalimpong next month," said the chief minister. She also acted on her promise by announcing three development boards for Khas, Gurungs and hill-based minority groups that include Muslim, Christian, Bengali and Hindi-speaking people. With these, the number of boards in the hills has gone up to 15. Trinamul Congress leaders in the hills said the frequent visit to the hills by the chief minister would give a boost to the party in the run up to the municipality and panchayat polls. "Her popularity in the hills grows after every visit. She has been initiating development works through various development boards. Like she said today, the government has so far given about Rs 268 crore to these boards. People are excited. We want the chief minister to increase the frequency of her visit, particularly in view of the approaching civic and panchayat elections," said a senior hill Trinamul leader. Mamata, who arrived here yesterday, will attend the 121 birth anniversary of Netaji Subash Chandra Bose at Chowrasta in Darjeeling tomorrow. She today laid the foundation for or inaugurated 34 projects spread across north Bengal. The chief minister gave away Bango Ratna awards to one person each from seven north Bengal districts. The seven who received the Banga Ratna award were Kamalesh Sarkar from Cooch Behar, Balram Hazra from Alipurduar, Kamala Kanta Roy from Jalpaiguri, Samar Chakraborty from Darjeeling, Tapan Saha from North Dinajpur, Dr Anmol Chandra Roy from South Dinajpur and Shakti Podho Padro from Malda for excelling in different fields. The awardees were given a plaque and Rs 1 lakh each.